Here are the races everyone in the state gets a chance to vote on. Results: Gov. 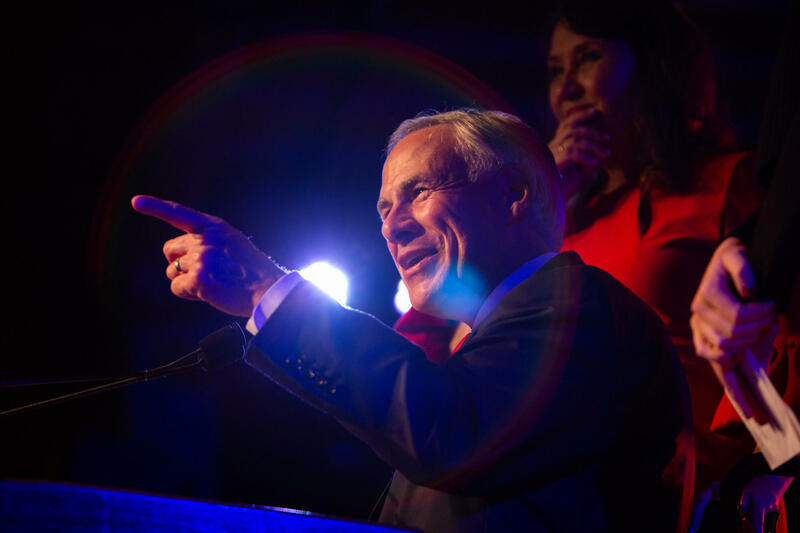 Greg Abbott is the projected winner with 56 percent of the vote. Gov. Greg Abbott gestures to supporters at an election night watch party at Brazos Hall. Background: Republican incumbent Greg Abbott is trying to secure his second term in office. He's pushing his accomplishments during his first term, including passage of an anti-sanctuary cities law, and the state's top ranking in several business-climate surveys. If he wins a second term, he wants to implement a school-safety plan he released after the deadly shooting at Santa Fe High School. He also wants to continue efforts to lower property taxes. Former Dallas County Sheriff Lupe Valdez is the Democrat on the ballot. She's pushing reforms to the criminal justice system, like ending mass incarceration and decriminalizing marijuana possession. She also wants to boost state spending on public education to help fix the current school finance system. She supports the creation of a universal background check for gun purchases and the passage of so-called red-flag laws that give courts the ability to remove guns from those deemed at risk of hurting themselves or others. Libertarian Mark Tippetts has a platform with three simple messages: He supports a free market economy and decriminalizing marijuana, and he opposes President Trump's border wall. Results: Incumbent Dan Patrick is the projected winner with over 51 percent of the vote. Background: Republican Lt. Gov. Dan Patrick is seeking his second term in office. While he doesn't list campaign issues on his website, he's never shy about sharing what'd he do with another four years in office. Patrick wants to continue efforts to cut government spending. He supports a school voucher plan and wants a state law that restricts bathroom use for transgender people. He opposes Abbott's suggestion that the Legislature pass a red-flag law that lets courts remove guns from someone deemed a danger to themselves and others. Democrat Mike Collier, honestly, doesn't agree with Patrick on much of anything. He's opposed to school vouchers and a bathroom bill. He'd like to see the state increase its funding of public education as a way to lower property taxes. He wants the state to pass Medicaid expansion under the Affordable Care Act, and he'd like to see those red-flag gun laws passed. Libertarian Kerry McKennon is quite direct on his issues. He wants to eliminate property taxes, the death penalty, laws against marijuana and prostitution, and bans on gambling. Results: Incumbent Glenn Hegar is the projected winner with 53 pecent of the vote. Background: Republican incumbent Glenn Hegar is seeking a second term as the state's accountant. His campaign focuses on things like government transparency and tax reform, along with cutting regulation and red tape for the state's businesses. But his website also points to topics that have nothing to do with the comptroller's office, like religious liberty, abortion and gun rights. Democrat Joi Chevalier's campaign focuses on two major areas: tax and revenue modernization, and improved costs and benefits analysis to help drive better priorities. Yeah, a little wonky. The first part, tax and revenue modernization, focuses on closing loopholes and updating current taxes. The second part is all about making sure state money is being spent the right way. That includes studying what happens if the state declines to invest in certain areas, like public education or infrastructure, and local governments are forced to sell bonds to cover the bills. Ben Sanders wants to push forward the traditional Libertarian agenda from the comptroller's office: limited government, personal responsibility and constitutional rights. Results: Incumbent Ken Paxton is the projected winner with over 50 percent of the vote. Background: Republican incumbent Ken Paxton is seeking his second term in office. The last four years have been marked by coverage of his indictments on securities fraud charges and his office's attack on federal laws, including recent efforts to eliminate the Affordable Care Act's ban on charging people with pre-existing conditions more for health insurance. His re-election bid includes issues like securing the border, banning abortion, protecting gun rights and guarding religious freedoms. Democrat Justin Nelson has hammered on traditional Democratic priorities like consumer protections, immigration changes, and ending gerrymandering. But he's gained the most attention for rallying against Paxton's efforts to end the pre-existing condition ban on health insurance. Libertarian Michael Ray Harris, an attorney, is also on the ballot. Results: Incumbent Sid Miller is the projected winner with 51 percent of the vote. Background: Republican incumbent Sid Miller is pushing his accomplishments during his four years in office. While his biggest splashes have been with controversial social media posts, his campaign focuses on making sure BBQ scales weigh meat correctly and efforts to find and stop credit card skimmers at gas stations. He also canceled the nutritional food program started by former first lady Michelle Obama and brought deep fryers back to school lunchrooms. Democrat Kim Olson is running on preserving the state's water and land, specifically farmland. She wants to increase the nutritional value of school lunches, without turning off kids, and make sure the state's food supply is safe. Libertarian Richard Carpenter is also running. Results: Incumbent George P. Bush is the projected winner with 54 percent of the vote. Background: Republican incumbent George P. Bush is running for a second term as land commissioner. He is focusing on his accomplishments in office, which he says include fighting radical environmentalists and trial lawyers, working to preserve the Alamo, and fighting the federal government's attempt to take over some Texas land. His website also focuses on his opposition to abortion and support of public school vouchers, which don't actually have anything to do with the Land Office. Democrat Miguel Suazo has criticized Bush's efforts at preserving the Alamo and protecting the Gulf Coast. He says the office's response to Hurricane Harvey has been a disaster, and he wants to spend more time and resources preparing the coast for the next storm. He acknowledges the science behind climate change and wants to promote a mix of renewable and fossil fuels to make sure the economy stays strong. Libertarian Matt Piña also criticizes Bush's handling of the Alamo and says he'd return control of the property back to the Daughters of the Republic of Texas. He's critical of the state's hurricane recovery efforts and wants to do a better job supporting disabled veterans through the Land Office. Results: Incumbent Christi Craddick is the projected winner with 53 percent of the vote. Background: Republican Christi Craddick is running for a second term. She believes the job of the commission should be to thoughtfully regulate the state's oil and gas industry. She wants to limit federal regulations in the state and balance efforts to protect Texans while not hurting energy production. Democrat Roman McAllen has been a critic of the way Craddick does her job. He says he's worried about campaign donations from energy companies that help pick who regulates the industry. He would push to protect the state's water and focus on enforcing existing environmental protections. Libertarian Mike Wright is running on three main issues: He wants greater transparency within the commission, better efforts to recycle the state's water and to ensure energy companies that pollute are held accountable.